Our customers demand the best, so we provide the best – from the solutions we offer to the industry-leading brands we represent. 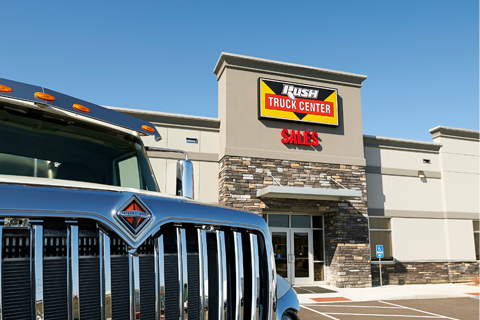 At Rush Truck Centers, we approach service differently. Our goal is to increase your uptime and lower your operating costs. Our state-of-the-art full service dealerships are staffed by highly trained, ASE-certified technicians and equipped with everything to keep you up and running. And with more than $200 million in parts and accessories inventory, chances are we’ll have the part you need when you need it. Whether you’re looking for vehicle integration engineering and installation, mobile service and technicians, complete outsourced shop management, alternative fuel systems and service, real-time vehicle repair status, telematics, value-driven replacement part options, ready to roll inventory or just plain advise, we’re committed to being your complete solution provider. And if we don’t offer the solution you need today, just ask and we’ll do everything we can to offer it tomorrow.